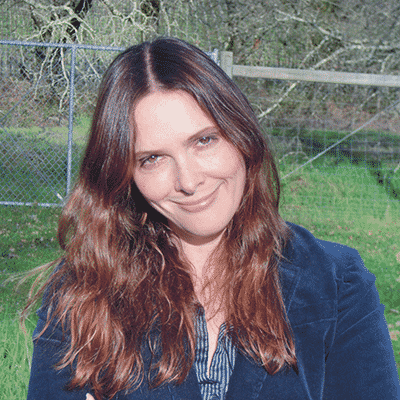 Hey there, I am Chelsey, founder of Good Grow. Getting rid of weeds & preventing them is easier than you think. Don't be overwhelmed by all the different advice you read. Here, at Good Grow my team and I breakdown the all complex weed control advice and information out there and give you the stuff that actually works! This beginners guide is the perfect place to start for anyone looking to eliminate their weeds or prevent them from growing. You can read more about me, my story and how I started Good Grow here. My goal is to bring honest, genuine, actionable weed control advice to as many as possible. Gardening advice is a crowded market these days. There is so much information (and misinformation) out there. We go the extra mile to give you the best chance at achieving your garden goals. Make it easy: We breakdown all the complicated science and explain it in an easy to understand way that anyone can follow. You don't need to be a horticulturalist to follow us. Give advice for real people: All of our advice is geared towards real people. We understand people lead busy lives, have kids, jobs & responsibilities. We make our advice fit your busy schedule. Use a step by step approach: Most of our advice is presented in a start to finish approach. Guiding you through each step of the process makes achieving your garden goals easier. Give an unbiased review: Many experts avoid criticizing certain advertisers or companies. We strive to give you impartial, unbiased advice so you can make informed decisions. Focus on what actually works: Our advice focuses on the easiest methods to achieve your goals. Spending lots of money on expensive products that over promise is out of the question. You can find of our top content on our homepage, new content is at the top of our blog. Community members also have access to exclusive videos, insider tips & special garden hacks. We post regularly so check back often or follow us on Facebook, Twitter or Pinterest. Community members also get first look access to some of our exclusive content. Join our growing community of over 10,000 gardening enthusiasts from across the globe. To get started here are some of our best articles that will help you get started on your journey. Step #1 : Identify weeds, know your enemy. Always know your enemy. Some weeds can be an indication that something is wrong. Dandelions for example like a soil PH of 7.5 which is quite acidic, moss in your lawn can be a sign if drainage problems. If you don't solve the underlying problems the weeds will come back. Step #2 : Get dirty, try manually first. Pull it, pick it, dig it - whichever method you choose make sure you get the roots! Perennial weeds may grow back if you don't get the entire plant, roots included. Weeds are either annual or perennial. Annual weeds grow and die in one season. They will spread their seed across your garden but are typically quite easy to eliminate. Just make sure you get them early. Perennials grow deep roots and can regenerate from deep underground. If you don't dig out the whole plant it may grow back. Step #3 : Is there a natural way to do it? 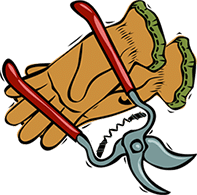 If you've tried manually pulling the weeds or it's unfeasible to do so then your next port of call should be to find a natural way to eliminate the problem. 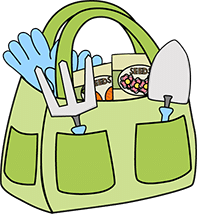 Small weeds can be easily dealt with using homemade weed killers such as salt, vinegar, hot water or a combination of all 3. These all have their faults but if your looking to kill some small weeds on paving or gravel then it may work. Step #4 : Chemical weed control. Your last resort should be chemical weed control. Sometimes it's necessary, always read the label and follow the instructions carefully. There are a wide range of selective and systemic herbicides. Selective ones will only kill certain weeds and are typically used in grassy areas. Systemic herbicides will kill anything they touch and should be used with care. 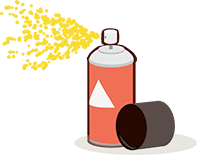 The vast majority of chemical products require some sort of spray application. They should only be used on calm, wind free days to prevent damage to your person & other plants you may wish to keep. Step #5 : How to stop them growing back. The best cure is prevention. Cover any unused soil with mulch or fabric, weeds will quickly colonise bare soil. No sunlight = no weeds. 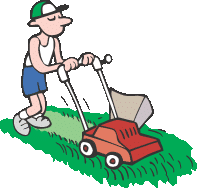 Lawns should be mowed at least 3 inches high to prevent weeds getting a foothold. Regularly clean your concrete paving using soapy water. Any build up of dirt on your paving will allow weeds to grow. Ensure all cracks are sealed using sealant. Myth #1 : Spraying herbicides results in super weeds. There is no evidence to suggest we are on the brink of a super weed crisis. The continued use of a single herbicide class for over 50 years on an industrial scale has lead to some developing a resistance. Even Darwin could have predicted that. Myth #2 : Digging is required to control weeds. Burying weeds is a sure fire way to kill them but it isn't always practical. Digging your soil may well disturb some dormant seeds and awake new weeds. There are numerous ways to kill weeds: mulching, herbicide use and shallow hoeing are some of the most popular. Relying solely on herbicide use is a panacea. The wide spread adoption of herbicide resistant crops only exacerbates the problem. If we are to be successful in preserving the usefulness of herbicides for future generations a combination of physical, chemical, cultural and biological methods will be required. For the part time gardener the use of herbicides shouldn't be a concern. Use it as a last resort, always read the label and follow the safety instructions. Myth #4 : It is best to kill dandelions in the spring. Don't wait till they flower in the spring. It's too late. 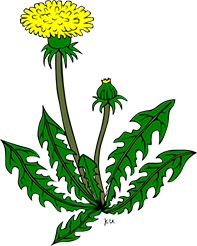 Dandelions should be controlled in the autumn before they flower the following year. The best way to control dandelions in your lawn is to grow a longer, thicker grass: about 3 inches is right. Shade the weed with the grass or the grass will shade the weed. Myth #5 : Organic fruit & veg contain no pesticides. You will find pesticides in ALL crops. All fruits and vegetables contain natural pesticides. The words natural or synthetic don't mean it's safe or unsafe. Any herbicide must be applied as directed on the label & used responsibly. Please don't be complacent. Sometimes the only thing for it is a very strong commercial weed killer.